Women's rights activist Urmila Chanam on Saturday addressed the 7th Asia Pacific Youth for Human Rights Summit, 2019 in Taiwan and spoke how menstruating girls and women in India are being isolated in violation of human rights. Addressing the congregation who came from various countries, Urmila, the social activist from Manipur who has been fighting for women's right especially in regards to menstruation said: "Any girl who is menstruating in India is considered dirty, polluted, impure and untouchable. They are isolated" . "Many communities push the menstruating girls to stay outside in a hut, away from their house," she said. She cited an example of a menstruating girl in Tamil Nadu who was killed in a cyclone on November 16, 2018 after she was forced to stay away from the rest of the family. "This is what is happening in India," the founder of 'Breaking the Silence' said. She also highlighted on how 'Breaking the Silence' is training and educating people about the myth, taboos and hygiene about menstruation in various ways in many countries. 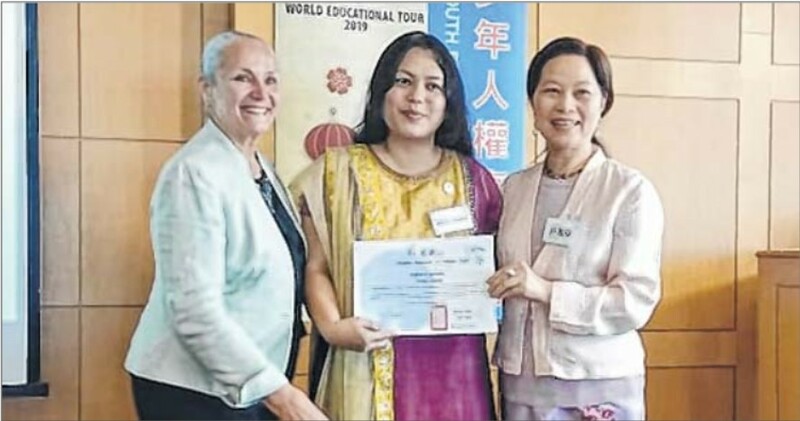 The 'Iconic Women' Awardee at Women Economic Forum (WEF) also spoke on the importance of the involvement of men in training and understanding menstruation. "....each home has men and women and anything to do with women empowerment must take the men along," Urmila said. Breaking the Silence with various groups, NGOs are pushing for implementation of a National policy on menstruation, she said. Urmila represented India at the summit and was the bearer of the Indian Tricolour at the grand opening ceremony held in Hotel Le Medi Friday. The summit was organized by Chunghwa Association of Human Rights, the Taiwan Chapter of Youth for Human Rights International from March 29 to 31 .